Advancing women’s equality would boost global GDP by 11 percent — or $12 trillion — and transform lives and communities in immeasurable ways. Work towards equity is multi-faceted, rooted in shifting cultural norms, advancing parity in caregiving responsibilities, and building access to education and professional opportunities. But a standard measure of progress exists in closing a decades-old wage gap. Today is Equal Pay Day, a date that symbolizes how far into the year women must work to earn what men earned in the previous year. Women in the U.S. earn just 80.7 cents for each dollar earned by their male peers, meaning they must work 20 percent more days for equal pay. But the pay gap varies widely based on race and immigration status: Immigrant women earn 75 cents for each dollar earned by a man. Black women earn 61 cents. For Latina women, the number is 53 cents. Equal Pay Day falls even later in the year for women of color and female newcomers. 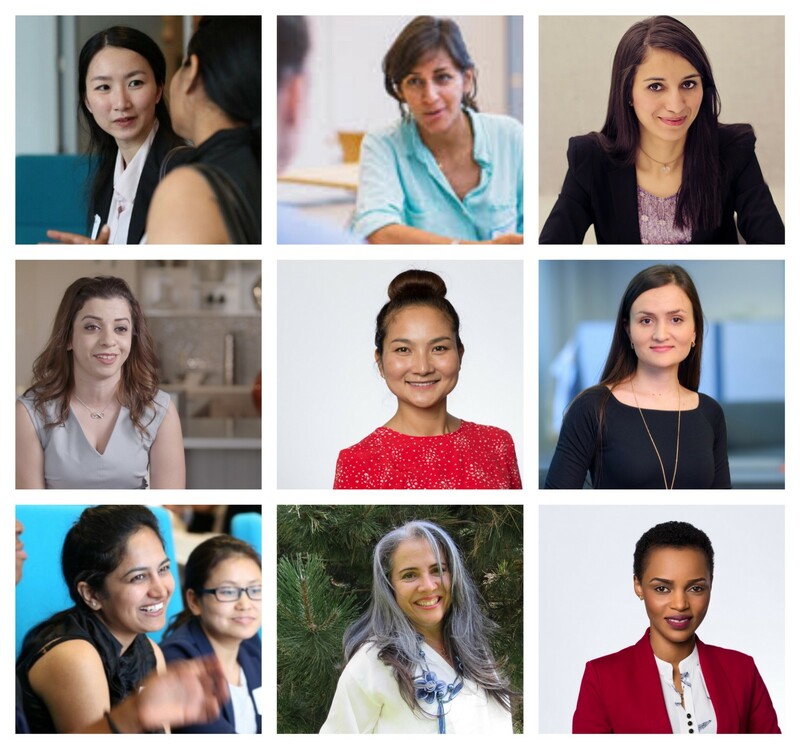 As part of our mission to unlock economic opportunities for immigrants, refugees, and asylees, Upwardly Global is committed to centering the voices of women in conversations around discrimination and equal pay. We recently convened four panelists — women of color from Latin American, Middle Eastern, and African countries — for an inaugural #SheGlo dialogue. Zinah, an HR professional from Iraq; Jacqueline, an international development professional from Uganda; Belkina, a licensed dietitian from Venezuela; and Mahlet, a communications professional from Ethiopia led a candid discussion on the obstacles they faced as newcomers and women rebuilding professional careers in the United States. Many of their challenges — ranging from limited professional networks to language barriers to challenges with licensing and credentialing — are shared by their male counterparts. But other obstacles have a decidedly gender-focused dynamic. UpGlo Protip: After the excitement of landing a job, salary negotiation can be a tough final hurdle. UpGlo advises job seekers to never accept the offer on the spot. Thank the person making the offer and ask for some time to think it over. Even if you don’t think salary can be negotiated, it never hurts to ask. Research the market ranges for similar positions using websites like Glassdoor and PayScale. Determine your ideal salary and develop a way to pitch it to the employer, highlighting the unique skills that you bring to the table and the ways that your work will serve the organization. Practice and deliver your pitch — and be prepared for all possible outcomes. The employer may accept the pitch, reject the pitch, or land somewhere in the middle. In response, you can accept the offer, counter the offer, or walk away. No matter the outcome, keep the conversation positive and focused on building the best possible outcome for both employer and employee. Research shows that working mothers and caregivers bear the brunt of the wage gap as out-of-office responsibilities jockey for priority against long-term professional goals. Inflexible workplaces and cultural assumptions about women’s commitment to their job after children play a role in perpetuating pay disparities and stifling pay equity and gender equality. Studies have documented a frustrating “fatherhood bonus” and “motherhood penalty:” women’s pay dips four percent after having children, while men’s rises six percent. Yet #SheGlo panelists demonstrated how family responsibilities also affect the career choices of women without children, particularly newcomer women responsible for financially supporting families back home. “When I got to the U.S., I was focused on making money. I needed to take care of my family. I took the first job I could get, and didn’t negotiate my salary,” said Belkina. Social norms may also limit single women’s professional mobility. After arriving in the US, Mahlet recognized that relocating to a larger city would open professional possibilities. But she struggled to find a female roommate to share housing costs, and social norms prohibited her from sharing housing with a man. “Being a woman limited my mobility,” she explained. UpGlo Protip: UpGlo advises job seekers to balance their immediate work needs with their long term goals. Women newcomers often need to find work fast and take what we call a “survival job” — a job outside of their profession — to pay the bills. This can ease financial pressure and allow time to find the right professional job. But there still needs to be time for the job search. UpGlo coaches job seekers to invest 5–10 hours each week: sending applications, attending networking events, and preparing for upcoming interviews and attending interviews. Make a plan to allow for that time each week. Stay focused on your long-term goal, and understand the incremental steps necessary to get there. Gender-based pay gaps in the U.S. are amongst the highest in the world, despite federal laws mandating equal opportunity and equal pay. Yet even with its flaws, panelists agree that the U.S. often offers a refreshing change from gender dynamics in their home countries, where discrimination and disparities are often more institutionalized. Even so, navigating new dynamics can come with new challenges: Newcomer women may be unsure how to engage with employer programs and policies meant to foster collaboration and cohesion. UpGlo Pro Tip: UpGlo offers tips for newcomers navigating U.S. office culture for the first time. Like other countries, the U.S. has norms regarding professional attire in the workplace and image is important. Ask about the appropriate dress code before you arrive at your first day of work. In your first days at your new office, introduce yourself to coworkers. As you encounter new people in the hall, elevators, or in meetings, take the time to ask what your colleagues do, what group they’re a part of, and how your position interacts with theirs. Do lots of listening. Your first days at work offer an opportunity to understand the big picture, the culture, and the priorities of your new workplace. Achieving gender equality would benefit our economy, alleviate poverty, and enable more women to participate in the workforce. All women, including newcomers to our nation, should have equal opportunity to pursue their professional dreams and to reap the rewards of their work. When women like Zinah, Jacqueline, Mahlet, and Belkina are able to fully contribute their talents to the U.S. economy, we shape a stronger shared future for all Americans. Follow Upwardly Global on Facebook , Twitter and LinkedIn. Upwardly Global is a national nonprofit organization that works to eliminate employment barriers for skilled immigrants and refugees.